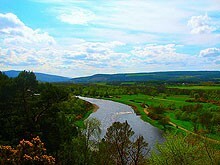 The Speyside Way can be walked over five to seven days depending on the time available and if you want to walk the Spurs along the way. Choose according to your available time and the pace you find most comfortable. Click on the links below to have a look at the details for each holiday. 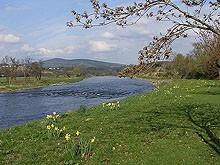 Don’t underestimate the time you need to enjoy the fine scenery and distilleries. 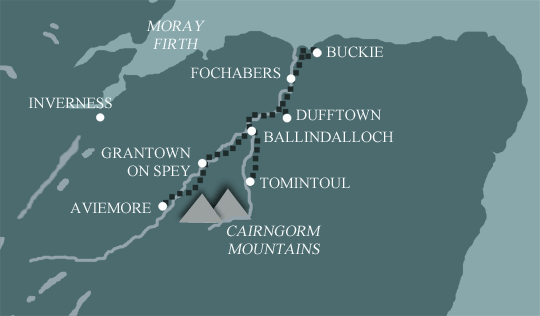 This is our full Speyside Way route including the Tomintoul Spur with fantastic views across to the Cairngorm Mountain Range. We are looking forward very much to next year’s holiday. We will be celebrating our 30 years of happy married life together and Devon and Cornwall paths might be the perfect way to celebrate. 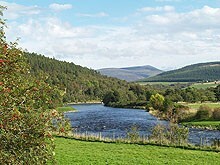 We really enjoyed this walk, not least this was due to the efficient organisation by Mickledore. Thank you very much. Would you use Mickledore again? Absolutely. Particularly enjoyed your selection of B&Bs/hotels.